Recipients were also granted an annuity, the amount of which was based on rank. For service within a state, where no Battle clasp was awarded for a specific action within that state. A smaller version of the oak leaf device is attached to the ribbon when worn alone. 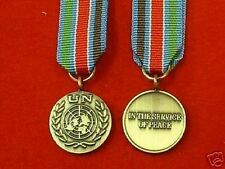 Jacket Medal Holder Miniature Size Medals, Plastic, Army, Military, Blazer . Condition is New. Dispatched with Royal Mail 1st Class Large Letter. MOUNTED ON A BAR FOR WEAR. Starting price is the reserve. Collection Of Various Dress Miniature Military Medals, Including Gallantry Etc. All the medals are included. Some medals may be period and some later, probably a real mix. Please see photographs for the ages and condition. I would be most grateful if you can ensure that you respond to my invoice and complete the deal as speedily as possible to avoid frustration and delay. Here we have a Miniature Military Medal Queen Elizabeth The 2nd . Condition is Used. Dispatched with Royal Mail 2nd Class Large Letter. I am unsure on the metal, the medal does NOT swivel in mount. The medal is not magnetic. Quality Court Mounting using only the best materials - Over 16 years experience of court mounting. Swing Mounting also available. A plain Greek cross, with splayed ends to the arms, each of which bears the imperial crown. The obverse centre bears the monogram of the reigning monarch. Suspension is via a plain, flat bar with a small ring. Complete with ribbon. Military Cross. It is in MINT and unused condition. GV - GVI - EIIR.